Some of the worst effects of the global economic downturn that commenced in 2008 have been felt in Europe, and specifically in the Eurozone’s so-called PIIGS (Portugal, Italy, Ireland, Greece, and Spain) and Cyprus. 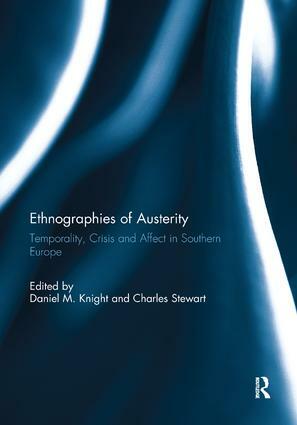 This edited volume is the first collection to bring together ethnographies of living with austerity inside the Eurozone, and explore how people across Southern Europe have come to understand their experiences of increased social suffering, insecurity, and material poverty. The contributors focus on how crises stimulate temporal thought (temporality), whether tilted in the direction of historicizing, presentifying, futural thought, or some combination of these possibilities. One of the themes linking diverse crisis experiences across national boundaries is how people contemplate their present conditions and potential futures in terms of the past. The studies in this collection thus supply ethnographies that journey to the source of historical production by identifying the ways in which the past may be activated, lived, embodied, and refashioned under contracting economic horizons. In times of crisis modern linear historicism is often overridden (and overwritten) by other historicities showing that in crises not only time, but history itself as an organizing structure and set of expectations, is up for grabs and can be refashioned according to new rules. This book was originally published as a special issue of History and Anthropology. Daniel M. Knight is a Leverhulme Fellow at the University of St Andrews, UK, and Visiting Fellow at the Hellenic Observatory, London School of Economics, UK. He is author of History, Time, and Economic Crisis in Central Greece (2015) and is associate editor of the History and Anthropology journal. Charles Stewart is Professor of Anthropology at University College London, UK. His most recent book is Dreaming and Historical Consciousness in Island Greece (2012). His current research focuses on syncretism, creolization, dreaming, the anthropology of religion and topics in the borderland between anthropology and history such as continuity/change, temporality, and historicity.